Looking for the best golf experience near Columbus, Ohio, look no further than the Virtues Golf Club in Nashport, Ohio. We are the only top 100 ranked public golf course in Ohio. The Golf Digest 2017-18 course rankings moved the Virtues Golf Club to # 65 in America’s 100 Greatest Public Golf Courses. In the fall of 2016, The Golf Magazine named The Virtues Golf Club, the Number One public golf course in Ohio, and no. 70 in Top 100 Courses You Can Play. Join us we continue in ensuring the Virtues Golf Club remains the preeminent Ohio golf experience. Come see what’s new at Ohio’s best public course and enjoy our 60,000 square foot clubhouse with exquisite cuisine and panoramic views. 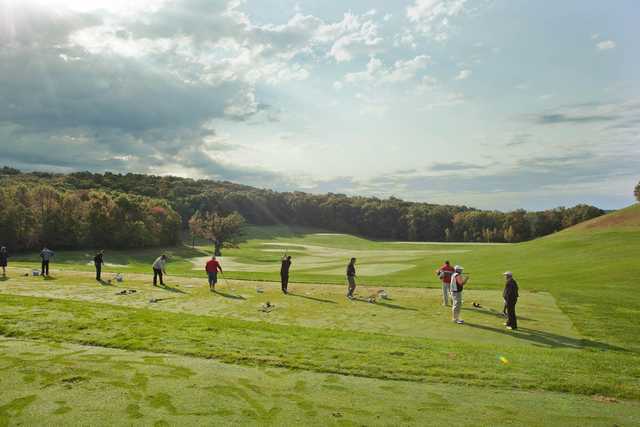 Located just 40 miles from downtown Columbus, Ohio, the Virtues’ spectacular Arthur Hills-designed championship golf course with an upscale banquet and event amenities, delicious dining and variety of player development programs offer any golfers a great reason to visit. The Virtues Golf Club is an immaculate place to golf with friends, a finely appointed venue for entertaining business associates and a memorable backdrop for events ranging from golf tournaments and weddings to holiday parties and fundraisers. The Virtues Golf Club is open to the public, with flexible and affordable membership options available. Our banquet facility is designed with extraordinary weddings and receptions in mind. Our majestic 60,000 square-foot clubhouse serves as a captivating backdrop for events of all sizes and types, ranging from intimate rehearsal dinners and bridal showers to lavish wedding receptions, while our variety of beautiful outdoor space – including a lovely verandah (overlooking the golf course) – provides a picturesque setting for wedding ceremonies, vow renewals, and al fresco luncheons. Your best wedding venue choice in Licking, Muskingum, and Coshocton County! Welcome to the Virtues Golf Club!